This property has 2 King(s), 5 Queen(s), 2 Full(s), 1 Pull Out Sofa(s), 2 Single(s). Our family of 13 stayed here over Christmas. As soon as we walked in the giggles started. This is the perfect big family, stay all together but don't get in each other's way space. Lots of room over the 3 floors. Great kitchen, lots of room to cook and hang out around the center bar area. There is plenty of cooking ware, but not enough glassware, luckily we brought our own champagne and wine glasses. Loved all the pantry space, much needed when cooking for 13 over 4 days. The Vons and Stater Bros. was close by too. The bar-b-que had plenty of gas and even though it was snowing we still put the crab legs on and cooked them up perfectly. We were plenty warm enough even when temperatures dipped into the teens. The game room was a big hit, there was always a game of pool or pingpong going on and in the loft area foosball, a french favorite. Another hit was the master bedroom shower, ha, sounds weird but it was perfect for a couple, a couple with a baby and the nana with her walker. The linens and towels were very good quality. The backyard was totally secure for our dog, another perk!! Jessica at WOWrentals was great, always responded to my email or texts within minutes it seemed. The folks from WOWrentals were there with the snow plow and shovels clearing the driveway after the first snow fell. Check in and check out was easy. Everyone had a great time and talk about returning in summer too. Mighty Bear Manor really made this Xmas holiday special. We loved Big Bear Manor! Pros: Large and spacious for multiple families. Everyone in our group was 100% satisfied with the rental and are planning to come back! We have stayed at many cabins over the years in Big Bear Lake. Mighty Bear manor was far and away the best cabin that we stayed at. We had a group of 9 and with 7 bedrooms over three stories, we had more than enough space. The home is a great neighborhood with all of the amenities including large flat screen tv’s and a pool table, ping pong table, and air hockey. We celebrated our 50th anniversary this year by gathering all of our three married children and seven grandchildren from all over the USA for a family reunion at the Mighty Bear Manor. The location was perfect! The venue was clean, inviting, open, great for family interaction and there were so many things to do for both children and adults. Ryan, our host, couldn’t have been more accommodating and kind. We hope to be able to return again some time. This house was perfect in almost every way. We stayed with our family (my wife and I, our 4 children and our grandchildren), and the house easily accommodated everyone for sleeping and bathrooms. The large family room on the main level and the large kitchen were great. The house was clean and well maintained, and it has a comfortable feel. You could fit 5 vehicles in the garage and 4 on the driveway. Wow Rentals, the property manager, was great to work with. We will definitely be coming back. This cabin was PERFECT!!! We planned a surprise birthday for my mom and we needed a place to fit all 16 of us. The range of our family is from 4-60 and there was stuff for everyone. We all fit in this cabin with plenty if room.....oh my there was sooo much room! We were even allowed to enter a little bit early to get everything set up before our mom got there. The cabin has everything you need...dishes, pots, coffee makers, towels, even laundry detergent and everything in between. All you bring is the food. I can not say enough about this cabin and we are already planning on staying here again. Thank you so much for having such a great place for large families to all stay together. I stayed 4 nights with my family and it was an amazing experience. The house is amazing and the view too! Tony and Kelly are really nice. Thank you! The house was great in all ways meeting our large family's needs. The location was great and there's plenty of off street parking including a large garage that helps load and unload for the days events. Close by are the two main ski areas and nearby is the main village of Big Bear Lake. All good, we highly recommend this place. Also, as a vacation home owner ourselves we appreciated the kitchen being stocked with plenty of eating utensils, plates, bowls, cups and glasses so we didn't need to constantly be doing the dishes. The main living room area is very comfortable with a warm fireplace and large TV perfect for watching the NCAA championship game as we did. Our entire group agreed that this place is perfect for our growing family especially grandkids so we will be back. Lastly, when needed for any questions or minor items, the property manager was very easy to reach and attentive to the need at hand. This home has a great fenced in yard for pets and children. We had a lot of snow that weekend and did not have to drive anywhere to sled. Nice hill on the side yard. We spent most of our time together in the great room and kitchen area. A large screen tv and couch. Kitchen table was big enough for 10. Great hot tub right off the Kitchen deck area Would recommend this house to anyone of all ages. This home is perfect for families not only with young children but all ages. They all were able to find something to do as it was spacious and stocked with enough to do. Loved that we were close to all we needed. Never felt cramped and would definitely come back again! The house was absolutely stunning! I had such an amazing time celebrating my bday here! I would definitely stay in this house again! We had a really great time at the Mighty Bear Manor. All of our guests were thoroughly impressed with the property, location, cleanliness and amenities. Lori, with WOW Rentals, was easily reached through text message for check-in and check-out time confirmation. Lori was nice, hospitable, and gave us a thorough walk-through at check-in. The hot tub on the deck was clean and well maintained. The home was gorgeous and the location was walking distance to Oktoberfest at the Big Bear Convention Center. The neighborhood was quiet and many people from our group enjoyed morning walks around the peaceful neighborhood. Excellent experience. We got the family from Indiana together to celebrate my sisters 60th birthday. The cabin is beyond amazing. NEVER felt crowded or without something to entertain us. Lori is awesome too. She was there for us when we couldn't figure out the alarm and she was very friendly and helpful. Would recommend this beautiful home and hope to visit again. I rented this space to host a meeting for myself and 7 of my direct reports. We were able to host a meeting in the living room and hook my computer right in to the big screen TV to show my PowerPoint decks. The couch could hold everyone, but 5 chose to spread out while the other two sat at the bench table in the room. We cooked all of our own meals in the spacious kitchen and grilled out for dinner one of the nights. The kitchen is well equipped but you will need to bring all of your own supplies. My team enjoyed the location and took sunset walks each evening. The house is very clean and all the rooms are very comfortable. The owner is helpful with any and all questions. We would definitely go back to this house time and time again. We live in SoCal and when our family came from the east coast we rented the house for 4 days. We had 12 people and there was an appropriate room for everyone from the the grade school kids, highschool, and college. We really enjoyed the game room and the beautiful deck on the second floor. The grill was great and we used it every night. The location was great with quick access to everything we needed. Very clean and well kept. I would love to go back in the winter. A really nice and fun family retreat! We rented this cabin for a group of 15 and it was absolutely perfect! There are 3 floors all with ample living and lounge space. The Kitchen is well equipped with pots, utensils and whatever you might need (besides food of course). The deck has a really nice view and the living room/spaces are really large. Everyone in our group was completely comfortable. There is also a hot tub, ping pong table, darts, pool and air hockey table (we didn't take advantage of these as we were out on the lake). The property manager, Lory is super sweet and met us right when we got to the cabin and gave us a tour of the place.The only minor downside is that there is no AC in the cabins so the master room in particular got pretty hot every morning. The main floor and top floor were also hot, but the first floor was much cooler. It was about 88 degrees when we went and it was manageable with keeping windows open and running the fans. Either way, I would still highly recommend the Mighty Bear Manor to anyone! I come up to Big Bear at least twice a year and this cabin for sure was one of my favorites. The amount of bedrooms, and square footage of living space/ kitchen truly made this cabin work for our large group. This cabin has such wonderful views, which really made you feel like you were on vacation. I would love to rent again in the future. THIS CABIN IS AMAZING. EASILY THE BIGGEST CABIN ON THE BLOCK! We did our yearly Big Bear trip in this cabin and I gotta say it was much better than expected. The layout with the kitchen, dinning area, and living room flows real well and is perfect for entertaining. The main deck off the living room was perfect for BBQing and having a cold beer while taking in the great views. The bedrooms were the perfect size and well appointed. Overall the property was very clean and well maintained. We're already planing our trip for next year and we already know where we're staying. Its hard to find anything to criticize on this house. The only thing I can think of was the light bulb over the shower in the master bath was out, but that's not a big deal cause there is plenty of light in there. I LOVED this cabin! It was beautiful. We had a full family, 16 people and we were all very comfortable. Even if we were allowed to bring more guests, we would have still had PLENTY of room for all of them. It was huge! And the owner was very nice, not intrusive whatsoever and the neighborhood was quiet but we still were able to bump our music all weekend. (My family is big on music). 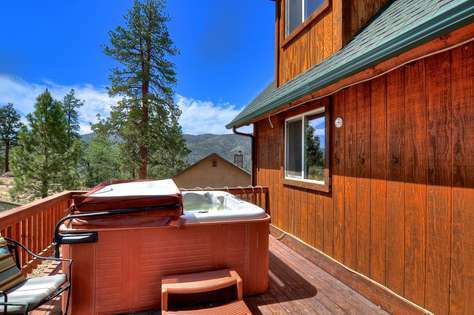 The cabin was clean, and they have a hot tub! If there was anything I can change, it would just be one room upstairs on the 3rd floor, it was just a little lonely I'm sure a few chairs or deco would make it pop forsure! But I'd definitely give this cabin 5 full starts because I didn't mind that at all, the master is GORGE. that was our room, let me say it was awesome. The shower, was even better lol. Everything about our stay was great. I'd definitely be back next year! Our group more than enjoyed our stay at this cabin. Plenty of room and the pictures do not do this place justice. There was snow and on the side there is a slope that the kids were able to use to go sledding. The back yard is fenced which was perfect for our family dog. The location of this cabin is right near all the stores and restaurants, about 1-2 miles away. We are definitely going to be staying at this cabin again next year. The owners were easy to deal with and very accommodating. We filled the cabin with family for grandpa's 90th birthday. Everyone, ages 2 to 90, had a great time! Lots of things to do. The place was very clean and well maintained. Near to markets and places to eat (1-2 miles). Locking garage door was tricky. Highly Recommend. There are plenty of activities for kids and the quiet community plus the scenic view offers an enjoyable walk. We had a family reunion at Might Bear Manor! It was a perfect house for all of us... had everything we needed and the layout was great! We we lucky enough to get the perfect Big Bear weather. It's location is great too! 5 minutes up the mountains, 2 minutes to grocery stores, 10 minutes to the village. I'd highly recommend this house to others for sure! In fact I already have! This cabin was exceptional!! My family and I decided to celebrate Christmas a week in advance. We needed a large house for our big family and this house could not be better. 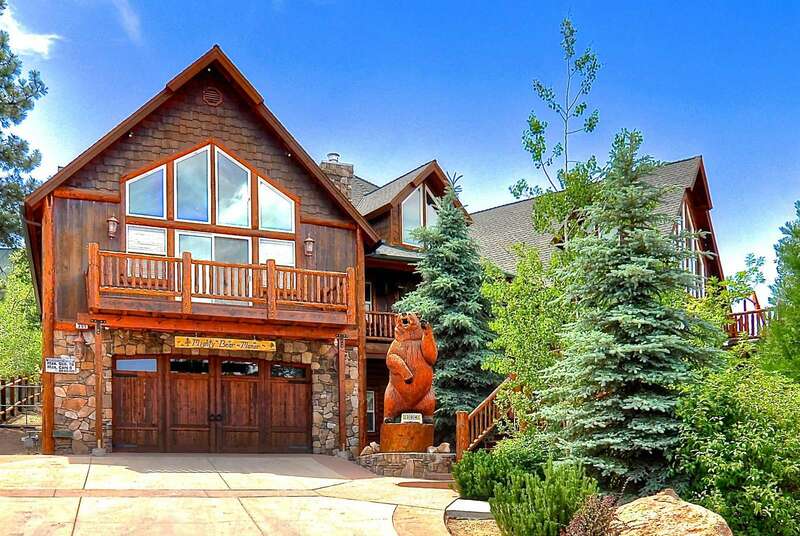 This custom bear house was a lot more than we had imagined. The house was equipped with EVERYTHING (even laundry soap and detergent). The description of the house was very accurate. Our children had a blast with all the toys provided inside the house and for outside. The cabin was very clean and well-maintained. Ryan and its property management were generous and kind. I asked for a late check-out and it was granted at a no-cost! The location of the home was the best! It was literally 5 to 10 minutes away from the village and outdoor activities. We are already looking forward to our next stay here next year! All I wanted for my 50th birthday was to get my family (4 under 10, 4 twentysomethings, and the rest of us) together under one roof where everyone could do their own thing yet hang out together. I searched CA, AZ, NV for the right place and ended up choosing Mighty Bear due to location, amenities and cost/benefits. My 5 star rating reflects those considerations plus how much each person in the group enjoyed the stay. 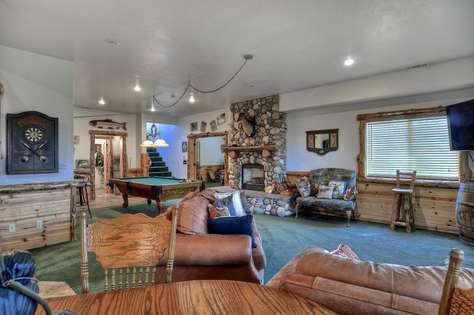 The three floors, game room, big kitchen, big great room, big decks, big master bedroom and hot tub let everyone spread out or gather as they wanted. The listing for this property is fairly complete. Here are some things I think might help if you are considering a stay. The max occupancy for anything in Big Bear is 16 people. There is room for 9 vehicles, 4 car garage and 5 in the drive. However, the driveway is steep. No street parking. There is an area that is technically part of the garage that has the air hockey, darts and ping pong. Only downside is that it was cold in there. The pool table is in the actual game room. The downstairs bedroom and one on the third floor have double glass doors that don't secure and use curtains - not so "private". The other bedroom on the third floor has a low ceiling. Not too bad, but it was a surprise. The third floor loft bedroom is open over a short wall to the ceiling over the dining area and has no door. The master bedroom/bath is huge. Heating system worked well. There are security cameras on the property. I get it, but would have been happier knowing that before I signed up. Overall fantastic experience! We will be back. We celebrated our friend's 30th birthday at Big Bear Manor, and it was absolutely perfect. The house has so many bedrooms with lots of hang out space. The kitchens is huge and has all the cooking essentials (but no dish towels, so bring your own!). We will definitely be back. The house is amazing. Lots of space, great views and a fun, rustic decor. Very comfortable, as well. My only complaint would be about the old, SD television in the main area. It was a pleasure staying at the Mighty Bear Manor. It is the perfect house for entertaining a large group. Very spacious with beautiful decor making us feel so at home in Big Bear. Large kitchen aloud us to cook and entertain easily. Balcony had beautiful views and we did not encounter any issues during our stay. The staff was very friendly and communicated with us regularly. Really enjoyed our time there and would definitely recommend as a place to stay! This was an AMAZING place for our huge family of 16. The price was such a great deal for the size and luxury of what it had to offer. It was very kid friendly (we had 5 kids under 5 years old). Clean and just perfect. Great view. Location was nice. The towels were soft. They even had laundry detergent! that was really nice. All of the things to do in the cabin kept our kids of all ages (5 under 5 and 2 teenagers) very occupied. The kitchen has plenty of appliances to cook huge meals. Ice and water in the fridge helped out a lot. Really loved the constant availability of Ryan to assist us when any questions we needed at any time. Would definitely come here again. Our huge family enjoyed this property so much. The property had so many rooms that we were able to have quiet time to ourselves when we wanted to relax & the common areas were also big enough to accommodate all of us when we wanted to be together. The place was equipped with everything we needed the whole weekend. I will cherish the memories we made at Mighty Bear Manor! My husband and I each have two adult children (from previous marriage) with families of their own. We wanted to have our first "blended family vacation". There were many things to consider, one of which was the size of the home (we had a total of 16 including children) and we needed at least six bedrooms. 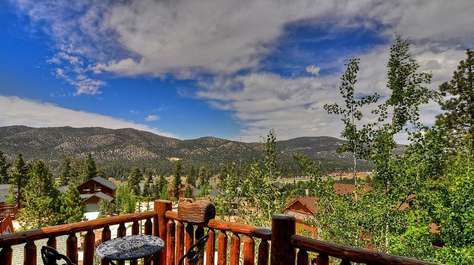 Plus, we wanted a home that offered a variety of activities within the home, and not far from Big Bear City/Lake. Big Bear Manor was THE perfect place! It had room for all, with great family meeting spaces. It was comfortable, cozy, yet very well-appointed and had great views from many of the rooms. The adults loved it and the kids didn't want to leave! There was lots to do just inside BBM. Something for everyone! This vacation brought us closer together as a family, and gave us precious memories to build upon. I HIGHLY recommend this home to anyone with a large family/group. You'll fall in love! We're enjoyed it so much we're re-booking for next year! Three families, 15 people. We were impressed with the space and activities the large cabin had to offer. Enough room for everyone to spread out. Game room was fully equipped with everything you could think of (ping pong, air hockey, darts, pool table, Wii, and two TVs). We had a great, memorable time and will be back for sure! Spent the wknd at Mighty Bear Manor. its the perfect house for multiple families! The game room, the kitchen and the balconies were our common hangout areas. I enjoyed the light air outside and all the pretty stars at night. We really loved our stay! We had a great time big bear was beautiful and the cabin was amazing big enough for the 16 of us! Spacious cabin for a big family gathering! We have many young kids. They just had a great fun with exploring the house. The house is stocked with games and toys. The only downside is that the master suite has no blinds and it faces east. I am not an early person, but the bright sunshine woke me up. 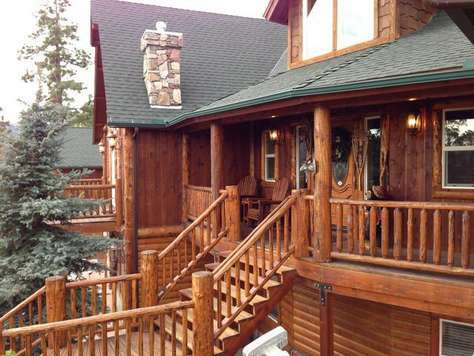 Well stocked Cabin, great views, and 3 floors of fun! This was our first trip to Mighty Bear Manor, we are a group of 6 friends who do a yearly trip, and generally have to shop around for a new cabin every year, which frankly is a pain. This year I was introduced to wowrentals.com, who rent out this fabulous cabin, and the scheduled a magnificent deal that fit our groups budget. The cabin itself if gorgeous, fully stocked kitchen, with knives that actually cut! Well placed BBQ, heated spa, a garage FULL of games, like air hockey, ping pong and a electronic dart board! The beds are comfortable, wowrentals provides shampoo / moutwash, soaps everything you would need. Upgraded the heating and cooling throughout the house with NEST thermostats, which made setting the temp easy and carefree. 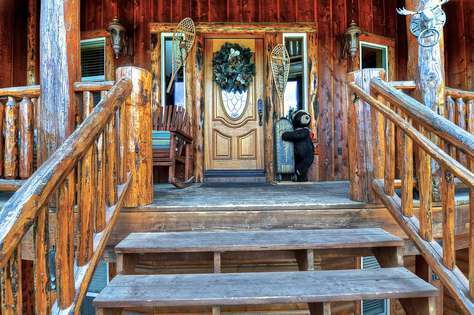 Definitely looking forward to booking next years accommodations through wowrentals, and the mighty bear manor is at the top of that list! Our family loved our stay at Mighty Bear Manor. We went to this cabin for a trip with my family and good friends. We wanted a place large enough for all to have their own rooms. As we drove up, our 1st impression was, wow this is a mansion. 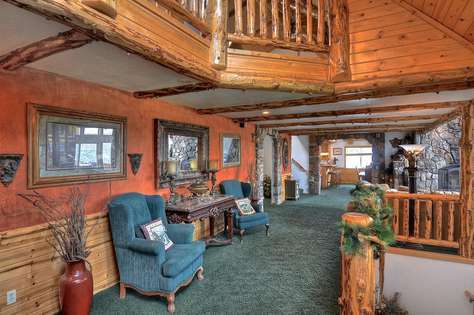 The home flows very well, it has all the amenities you need, the location is close to the slopes and restaurants and shopping. There is a very nice view from the balcony. We look forward to our next trip in the same house. My entire family enjoyed the Mighty Bear Manor. It was the first time we were able to have our entire family in one home, everyone had their OWN ROOM ! The Mighty Bear Manor is close to the slopes. Everyone enjoyed the spa after a day on the slopes. The little kids enjoyed sledding in the fenced backyard. The Mighty Bear Manor is huge yet still warm and cozy ! We Will Be Back ! Great family time in huge cabin! 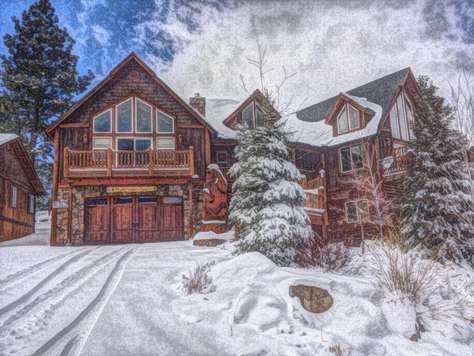 We spent a long weekend up in big bear with 4 families in this amazing house. It's huge and had plenty of room for all of us. Kids loved running around in all the space playing hide and seek. Adults enjoyed drinking beer, playing pool, ping pong and relaxing in spa. Good location in big bear. We went on some great walks in the evenings leaving from the front door. Great being able to get up in the mountains so close to the city. For large groups, this house is perfect. It is nicely updated, but still has a great cabin feel to it. Some great memories made there! 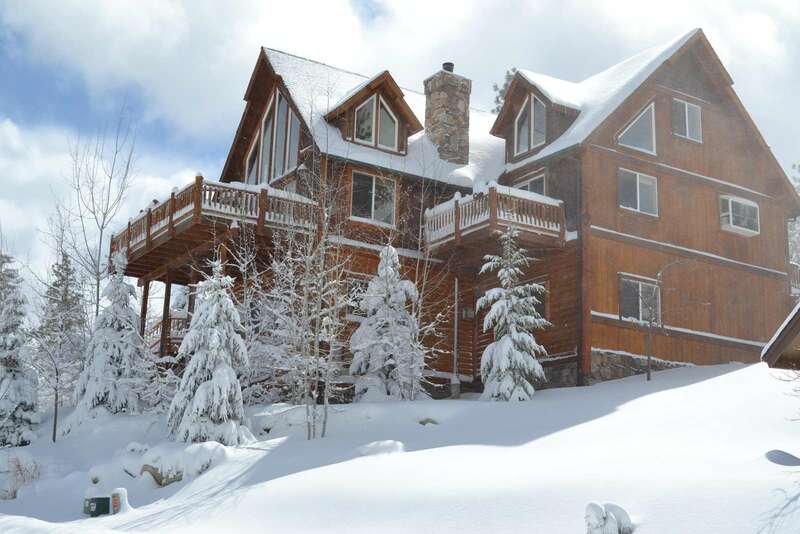 This is an enormous house with a great location- just a couple of minutes drive to ski slopes. The jacuzzi is really nice after the skiing. Owner is helpful and replies to email fast. The house has a pool table and table tennis. Very private and quiet location. Well maintained . Good heating system. So here is my group, bunch of 30 somethings looking for somewhere nice, we aren't kids anymore but don't want to go overboard with pricing. We had 6 couples, so 12 people, and wanted to be comfortable. Mighty Bear Manor definitely delivered. It is very well maintained, and just a beautiful property. When we arrived, everyone was just shell-shocked by the abundant space and beauty of the cabin. It is well situated about half a mile from the main road and close to stores. Each couple had plenty of privacy in their own rooms and the main area provided plenty of space for hanging out. Working with the property owner Ryan was a breeze. He responded to emails quickly, offered his cell phone number out to us and was more than ready to accommodate our group. He is a very involved property owner as far as your needs, but does not at all intrude upon your privacy. My only advice is to not go here during Oktoberfest because I want to rent it then, please leave this cabin alone in October. Being less than a mile away from the event, and a straight shot 1 mile, was absolutely perfect for celebrating Oktoberfest. I don't usually go on, but a great property coupled with a good owner deserves a good review. I don't see how anyone could be anything but happy when renting this property. I definitely impressed my group as the lead person in finding a property and will definitely return to this cabin. Thanks Mighty Bear Manor! Fabulous cabin! I've stayed in several cabins in Big Bear and this is by far the most memorable. Truly a "Manor". The custom layout and craftsmanship were impressive. 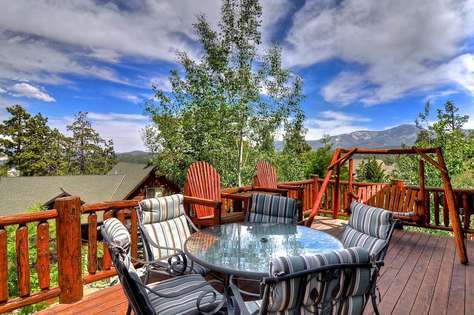 The remarkable cabin combined with the endless views from the decks and the serenity of the mountains and neighborhood made for a relaxing and rejuvenating experience. Thanks so much for sharing! We will be back! This place was amazing! The house is huge, we were a group of 18 guys and we had plenty of space and could easily cook for all of us. The house has everything you could ever want and was really affordable when you factor in the size. The boat was a great bonus but the house would've easily been worth it without the boat. Another great bonus is that the owner, Ryan, puts in a lot of effort and makes sure everything runs smoothly. We will definitely be going back to this place.